Sharma’s resume does not fall short of impressive, with accomplishments including serving on the Youth Advisory Board for the Alliance for a Healthier Generation and Bill Clinton Foundation, where her work of traveling across America as a student activist and teaching inner city students about making healthy choices was recognized by former President Bill Clinton. Sharma was also selected as a youth organizer for the Tennessee Immigrant and Refugee Rights Coalition, where she completed research and wrote talking points for legislative bills to raise awareness about immigrant and other marginalized communities. She’s also held numerous internships including positions in Congressman Jim Cooper’s office as well as Mayor Karl Dean’s Office of Innovation. Through these opportunities, Sharma’s hard work has not gone unnoticed. 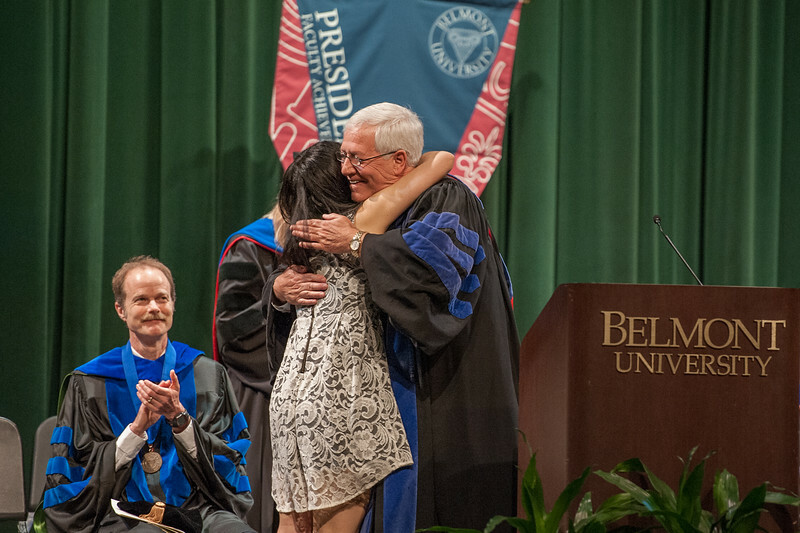 “Tina exercised her voice, her energy and her passions before arriving at Belmont, but over the last several years she has developed a confidence and clarity of vision that will bring not only personal success, but a path marked by enriching activity and genuine benefit to those who are fortunate to have her touch their lives,” said Professor Glenn Acree. Sharma has accepted a position with the Department of Strategy and Marketing at Google headquarters and will move to California shortly after graduation in May. A combination of tough obstacles and the support of countless community members, family and friends led Sharma to strive to be the person she is today. Sharma’s family lost their home to the flood in May of 2010, causing a period of homelessness. But even through the dire monetary and emotional circumstances, Sharma clung to her education and desire for success. Still, she credits her numerous accomplishments to the support from the important relationships she has formed. “This journey from vulnerable victim to now engaging leader has helped me to quickly discover and shape my purpose as an individual as I look to graduate this May: lifting others to succeed just as others have done for me. I believe that education is the most powerful tool for this sort of purpose because it gives individuals the resources to build their dreams, and it provides society a foundation for progress and change towards the better. When I had nothing, I still had a firm grasp on education,” said Sharma. Sharma’s passion for change through policy grew as she began working in Nashville’s Office of Innovation, making Nashville a friendlier city and one that embraces diversity, encourages community service and supports entrepreneurship. Her work included creating an open data executive order and implementing a plan for its execution, so that the large amounts of data collected in Nashville every year can be free and open to the public on a more accessible platform. Last year, Sharma was nominated and elected to the Board of Directors of the Nashville International Center for Empowerment, a nonprofit that works to resettle refugees from war-torn regions such as Darfur, Nepal and Iran to Nashville. And more recently, she was accepted as global shaper through the World Economic Forum, which works to create a more progressive and youth friendly city and represent the voices of young Nashvillians. As she transitioned from homelessness to advocacy, Sharma now aids others to transition from oppression to a welcoming home. Instructor Jose Gonzales spoke to the kindhearted and fun-loving spirit that Sharma exudes in addition to her academic achievements. “I led a Study Abroad trip during Maymester 2014, during which time I learned that Tina engages 100 percent in what she does. Tina’s participation in the program was startling. She made great friends with the students from the University in Argentina who were hosting us, she performed exemplary in the Business Plan competition at the core of the program in Argentina, and she even had the entire group of students (and their professor) doing yoga one morning at the foothills of the Andes!” said Gonzales.